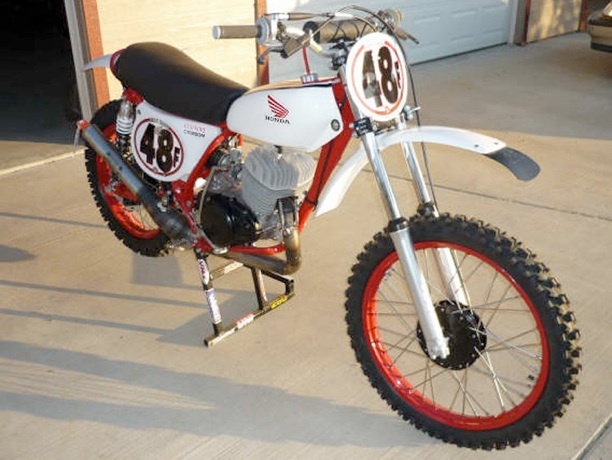 Here's one of my three ‘74 Honda CR250M’s that I restored. The other two I have restored in original Silver/Green color scheme and in Red/Black (racer). This is the latest one restored in Red/White color scheme. This was a complete frame off restoration. The frame was media blasted, gusseted, and painted. The motor was completely rebuilt, new piston, rings, bearings, seals and gaskets. Top end was bead blasted. New PVL ignition, New 36 mikuni carb. and billet aluminum intake., Proform pipe. The rear shocks were replaced with Works Performance shocks. New Pro Taper bars, controls. twist throttle and cables replaced. New VMX white plastic. Tank was painted by me in my restoration shop. Rims and hubs were powder coated, new Bucannon SS spokes, new tires, chain and sprockets. Billet aluminum rear brake stay arm and billet chain guide, wider foot pegs, seat foam and cover, front forks reworked by MCS Suspension and air caps added. All the nuts and bolts were replaced with new ploished hardware. I am currently racing the Red/Black bike on the AVDRA national curcuit. This White/Red bike and the Silver/Green bikes are for show. I haven't added gas to them yet since restorations were completed. All three have won cool bike awards as well.